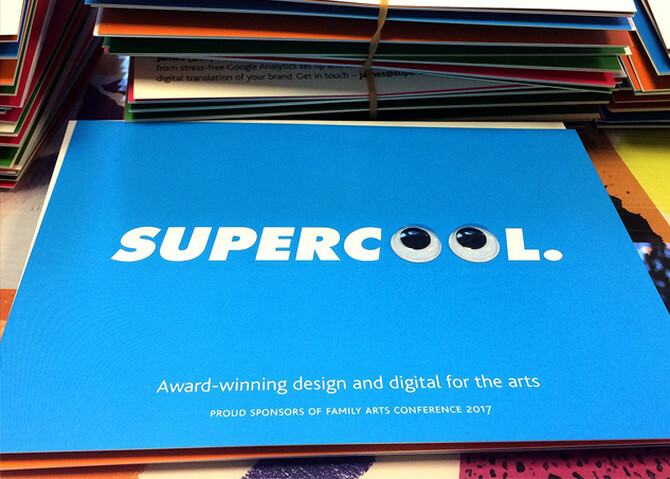 Last Wednesday we went along to the bi-annual Family Arts Conference, this year held at St George’s Bristol and sponsored by our good selves along with Spektrix. Billed as an exploration of age, diversity and inclusion in Family Arts, it seemed a good fit for us, as for many of our clients their family-focused activity is an important way of expanding audiences. I guess it's a similar principle to MacDonald’s having Happy Meals, minus any grease or guilt – introducing people to something (in this case 'the arts', rather than salty, extruded potato) at a young age helps build a habit; engraining cultural activity as a regular part of everyday life, and so encouraging a lifelong love of – and support for – the arts. 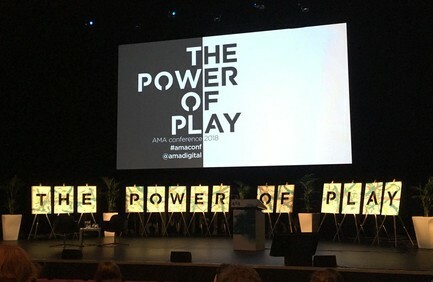 The conference's opening keynote was great – Estella Tincknel, Deputy Mayor of Bristol and an enviably strong advocate for arts and culture in the city, told us all about Bristol (without glossing over its less impressive side, which was refreshing) and the huge role the arts plays within it. She proposed that art and culture are important catalysts for change, for challenging what needs to be challenged, and for renewing social cohesion; with families cited as being a key part of this. 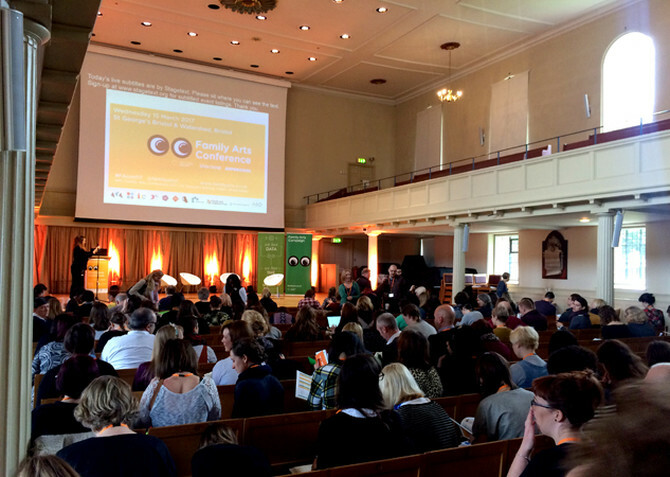 Further reinforcing the importance of family audiences, members of the Bristol Family Arts Network relayed some research showing that, although turnout for specifically-labelled ‘family’ events can be lower (initially), engagement is consistently much deeper. Another stand-out talk was from Kate Organ, who referenced a comment someone had made about – I’m paraphrasing here – local arts attendance being made up of a lot of old, grey-haired people … and their parents. Rather than this being seen as a problem to be overcome, Kate suggested that arts organisations should be embracing older people. Within the next 20 years 1 in 3 adults will be ‘an older person’, so there are economic – as well as ethical – reasons to engage with all ages. Thinking about this as a designer, appealing to something as wide as a ‘family audience’ is a challenge – there’s a tendency for briefs about family events to automatically assume promotions should look very child-focused when, in fact, it’s parents who’ll be planning a trip or buying the ticket, not the kids. And mightn't child-like styling be putting off families who don’t include younger people but would still be able to enjoy an event? There’s no easy answer. In terms of making digital things family-friendly, however, it’s a lot simpler as this essentially means making sure everything’s built to be as accessible as possible (i.e. well-built). Websites need to be quick to load and to navigate, and work on any device – whether it's being used by a busy parent trying to browse a mobile web page on a rubbish 3G connection with one hand while wrangling an irritable infant with the other; or a Baby Boomer looking for an event that’ll be suitable both for their grandchildren and an elderly parent. Much of the discussion at the conference centred around what actually constitutes a ‘family’ – with the conclusion being that it covers myriad relationships and age-groups. 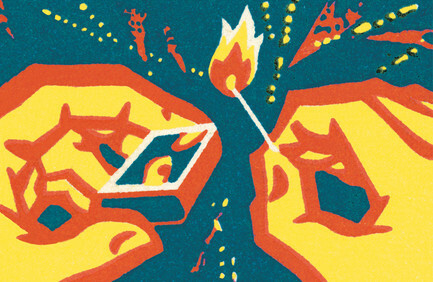 We have, however, noticed one common thread that runs through all family-focused arts and cultural events – and that's a very clear and unmistakable focus on encouraging people to experience the arts with others; conveying the arts as a sociable activity which creates shared experiences – and shared memories. 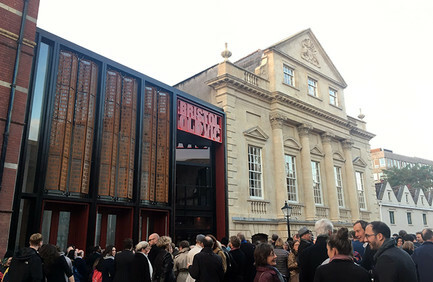 Yesterday Bristol Old Vic had a party to celebrate the completion of their major building redevelopment project. As their digital agency, we were lucky enough to go along and have an early explore of the place. And very fine it is too.